Bowmar/ALI Inc., Acton, Massachusetts, U.S.A.
Bowmar was a small company specialising in high technology components for the space programmes and produced a hand-held calculator as a demonstration device for its LED displays. 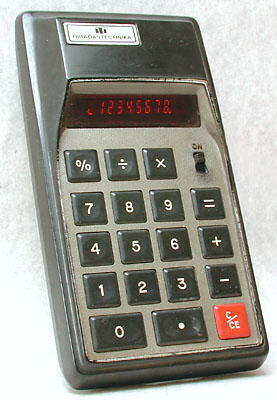 So good was the reception to the calculator that in 1971 it moved into large scale calculator production. Bowmar became one of the major manufacturers, making calculators for other companies and also selling under its own name. A report from 1974 on the calculator industry says that Bowmar is probably the largest manufacturer of hand-held calculators in the world and during 1971 and 1972 was Texas Intruments' largest customer for LSI calculator integrated circuits. Bowmar's total sales increased from $3m in 1971 to $64m in 1973, largely as a result of its entry into calculators. With the dramatic fall in calculator prices in the mid-1970s, Bowmar decided that it needed to manufacture its own integrated circuits to remain competitive and in 1974 invested in a semiconductor plant. However, prices continued to plummet and Bowmar had to file for bankruptcy protection early in 1975. See the article "Pioneering Calculator Companies: Bowmar" on this site. 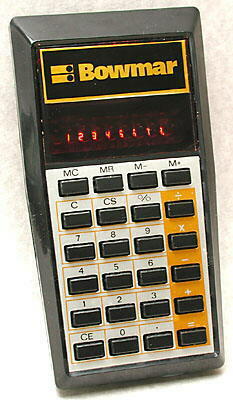 The first Bowmar calculator and the first hand-held calculator manufactured in the U.S.A, it was introduced in 1972. This model was also made for Commodore and Craig. 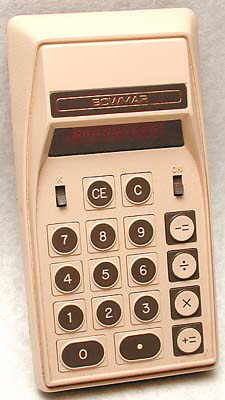 A typical Bowmar calculator from the mid-1970s, the Bowmar 905. This Bowmar calculator (without a model number) was unusually made in Hong Kong and not the U.S.A. It is date stamped July 1977, probably after production in the U.S.A. had finished and is the cheap "Standard 1" model, which was sold under various names. 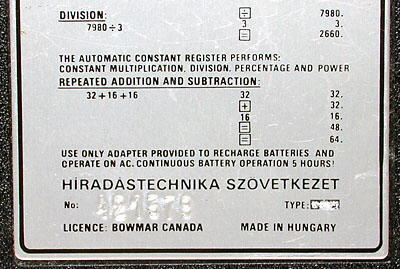 Bowmar MX-55 made under licence in Hungary by Hiradastecnika Szovetkezet. For further photographs of Bowmar calculators see the Calculator Photo Library on this site. Milton, R., Beaumont, A.J. (1974), Electronic Calculator Markets and Suppliers, 2nd. ed., Finresearch Series, London: Ovum, p7.